Synopsis: "This is a faithful saying, and worthy of all acceptation, that Christ Jesus came into the world to save sinners; of whom I am chief." This extreme statement by the Apostle Paul must define the way we live our life, and is the key to making any progress in virtue. It is a &mindset" that permiates Orthodox Christian life and prayers, but is not well understood. Let us look at how in our daily lives we can make this saying "worthy of all acceptation". Many examples from the scriptures will help us, such as the publican, the woman who annointed the Lord's feet, and the Apostle Peter. 1 Timothy 1:15-17 15 This is a faithful saying, and worthy of all acceptation, that Christ Jesus came into the world to save sinners; of whom I am chief. 16 Howbeit for this cause I obtained mercy, that in me first Jesus Christ might shew forth all longsuffering, for a pattern to them which should hereafter believe on him to life everlasting. 17 Now unto the King eternal, immortal, invisible, the only wise God, be honour and glory for ever and ever. Amen. When is a Christian worse than an infidel? Today’s selection from First Timothy is interesting on a historical, sociological and moral level. The Christian church has declined over the centuries, and government has increased to take on roles (POORLY!) that Christians routinely accomplished in the early centuries. We should read this exhortation of St Paul to his son (in the faith) Timothy with great sadness, because we do not live in the same world anymore. Of course, the moral exhortation still applies, but we live in a darker world, with more physical wealth and also more decadence and spiritual poverty. Especially in the so called “developed” world, we depend on our secular governments to do charitable work, and they routinely do it poorly, because they are a hireling, and not the shepherd . We cannot change the structure of our society immediately (and I think, not in a significant way, ever, till the Lord comes), and we should not read St Paul’s words as a call to arms to somehow evangelically spread the Christian way of thinking to the world. This is the modern, media savvy Protestant way, but we Orthodox instead look to ourselves and see what is wrong, and with God’s help, try to fix it. My words will be offensive to some, but I believe firmly that much of what passes for Christian politics today is actually myopic pride, and will not be blessed by God because the interior man is not changing. Let us read these words and take then as a personal exhortation, and also a rebuke of our society, which has fallen so far from true Christianity. These exhortations are to Timothy about his own ministry, and also things that Timothy should teach the widows. What a concept! That women (and men), when they get older should devote more of their time, even “night and day”, to spiritual things. In our day, the older ones rely on their IRAs and retirement funds, so that they can live in houses too large to be useful, and travel and generally act as foolish as young people, albeit, with more money and less responsibility. Our churches should be filled with older Christians, who show by their words and deeds what it means to be a Christian! 5:1 Rebuke not an elder, but intreat him as a father; and the younger men as brethren; 2 The elder women as mothers; the younger as sisters, with all purity. These are instructions to Timothy, the young bishop, and protégé and spiritual son of St Paul. As instructions from an archpastor to another (arch) pastor, they apply to any pastor. They describe how we are to think. The operative words implied here, that must be present in any pastoral work for it to be successful, are respect, sensitivity and humility. If you disrespect anyone, then do not expect them to listen to you! All this stuff is really “common sense”, but we live in a world today where there is little “common sense” or any kind of spiritual sense. This introduces the “office” of widow, which was common in the early church. Although we are give respect to everyone according to their status (elder man, younger man, elder women, etc), there is another level of honor that is not obligatory, but must be earned. This is the honor the Apostle is talking about. He goes on to describe what a “widow indeed” is. We may extend his thought easily to all “offices” in life – to honor “bishops that are bishops indeed” (modern news shows that there are too many that do not deserve this higher level of honor), “priests that are priests indeed”, “fathers that are fathers indeed” etc. 4 But if any widow have children or nephews, let them learn first to shew piety at home, and to requite their parents: for that is good and acceptable before God. 5 Now she that is a widow indeed, and desolate, trusteth in God, and continueth in supplications and prayers night and day. One may argue that St Paul is giving a “legal” definition of a widow – that is, a woman “desolate” – without children or grandchildren or any family that will care for them. This definition certainly applies, but St Paul is also showing that a true widow will be a spiritual person, who prays a great deal, and is of exemplary character (see vs 10). As is always the case in Scripture, the spiritual meaning is far more important than the legal one. A person can be dead before they die! The true Christian will apply these words to everything in his life. 7 And these things give in charge, that they may be blameless. 8 But if any provide not for his own, and specially for those of his own house, he hath denied the faith, and is worse than an infidel. 9 Let not a widow be taken into the number under threescore years old, having been the wife of one man. 10 Well reported of for good works; if she have brought up children, if she have lodged strangers, if she have washed the saints' feet, if she have relieved the afflicted, if she have diligently followed every good work. We live in an age where children do not take care of their parents. Heed these words. 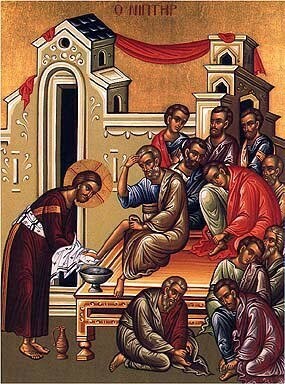 The reference to washing the saints feet refers to the custom of washing the feet of guests in the home. This is a reference to hospitality. John 10:12-13 KJV But he that is an hireling, and not the shepherd, whose own the sheep are not, seeth the wolf coming, and leaveth the sheep, and fleeth: and the wolf catcheth them, and scattereth the sheep. (13) The hireling fleeth, because he is an hireling, and careth not for the sheep. Avoid profane and vain babblings. Life is short. Treat each day as your last, and you will never sin. Brothers and sisters, contemporary wisdom tells us that "life is short," and so we should enjoy ourselves, take up a challenge, or make a difference in the world. We should not waste the little time that we have. Treat each day as your last, and you will never sin. Likewise, the holy fathers tell us that each day could be our last, and that we should therefore "redeem the time, because the days are evil." Or, as one of the desert fathers said, "Treat each day as your last, and you will never sin." Life is short, but what does this mean? The world tells us that we should enjoy each minute, entertaining ourselves, seeking new experiences and challenges, making the most of the time that we have, because this life is all that there is. The Lord tells us, on the other hand, that the short time of this life is given to us as preparation for eternal life beyond the grave. Time spent in amusements, "experiences," and even in great accomplishments that improve our life here on earth, is ultimately a waste of our time if we are not preparing our souls for eternity. Rather than experiences and worldly accomplishments, we should spend our time perfecting the Image of God — an Image of selfless, sacrificial love — in ourselves and in our lives. The old man does not understand this. When the Lord told his disciples about the resurrection, they did not understand. Even after the resurrection, only few understand this truth. And so we occupy ourselves with vanities. Avoid profane and vain babblings. "Avoid profane and vain babblings, and the oppositions of knowledge falsely so called." Worldly knowledge is ultimately useless, for the world will pass away. And knowledge based on reason and logic is ultimately untrustworthy, for our fallen reason is capable of proving anything that our fallen heart and will desire to believe. Let us heed the words of the Lord, and let the world follow its own course. Let us be, as the Apostle enjoins, "in the world but not of the world." You are currently browsing the archives for the Epistle:1 Timothy category.